It was a chronic thing: Almost every time Erma Taylor's great-grandson caught a cold, he also ended up having a severe asthma attack. Taylor, a retired nurse, spent many hours at a hospital, helping to hold the toddler for tests and breathing treatments, and wondering what was causing the attacks. The one thing Taylor never suspected was that something inside the Falls Church, Va., Cape Cod that she shares with her granddaughter and great-grandson was a source of the 3-year-old's medical problems. It turned out that mold and mildew from years of shampooing the decades-old carpet were aggravating the little boy's respiratory system. The carpeting was replaced with wood flooring through a nonprofit group called Rebuilding Together, and Taylor says she has seen marked improvement. "We haven't been back to the hospital since then," Taylor says. The trouble is that many homeowners and renters aren't aware of the link between their housing and their health. Radon exposure, for example, has no immediate symptoms. Carbon monoxide poisoning can initially resemble the flu. And exposure to some toxins may be confused with seasonal allergies. "In our cars, we have oil and check engine lights," says Rebecca Morley, executive director of the National Center for Healthy Housing. "There's no such light for a house." A federal interagency body called the Healthy Homes Work Group released a report, "Advancing Healthy Housing: A Strategy for Action," in February, with the goal of reducing the number of homes with health and safety hazards over the next five years. "People spend more time looking at the kitchen countertops than they do at issues that can cause serious health problems," says Nancy Harvey Steorts, a realty agent in Virginia and author of "Your Home Safe Home." "There are so many elements to having a home that's truly safe," says Steorts, former chairman of the U.S. Consumer Product Safety Commission. "Many consumers think that they don't have anything to worry about." Even Steorts, an expert in home safety, had a problem when she lived in Dallas. It started with a sore throat and escalated to symptoms of a heart attack. The problem stemmed from glue in the padding of carpet that had been recently installed, she says. "Here, this happened in my own home," Steorts says. Could your house be making you sick? Visit www.southcoasttoday.com for some common household hazards and some tips on how you can address them. In 2010, President Barack Obama signed into law a measure limiting formaldehyde emissions from composite wood products. But the rules haven't taken effect yet. If radon levels are elevated, the problem is easily corrected with a pressurized system that keeps radon from seeping through the home's foundation. Plumbing leaks and poor insulation are the main cause of mold and pests, says Steorts. Some materials, such as synthetic stucco, are easy to puncture and may allow moisture to seep in, says Vimal Kapoor, president of the Building Inspector of America, based in Germantown. An alarm should go off, he says, "if you feel better when you're out of the house." Mold tends to worsen respiratory illnesses, induce asthma attacks and irritate eyes and nasal passages, according to the Centers for Disease Control and Prevention. Some studies also suggest more severe effects, including flu-like symptoms. More surprisingly, cockroaches can be potential triggers of asthma symptoms among children allergic to them, says Stephen Teach, an emergency room physician at Children's National Medical Center who also runs the asthma clinic. Decomposing cockroach bodies and their excrement easily become airborne, and can be inhaled into the bronchial tubes. 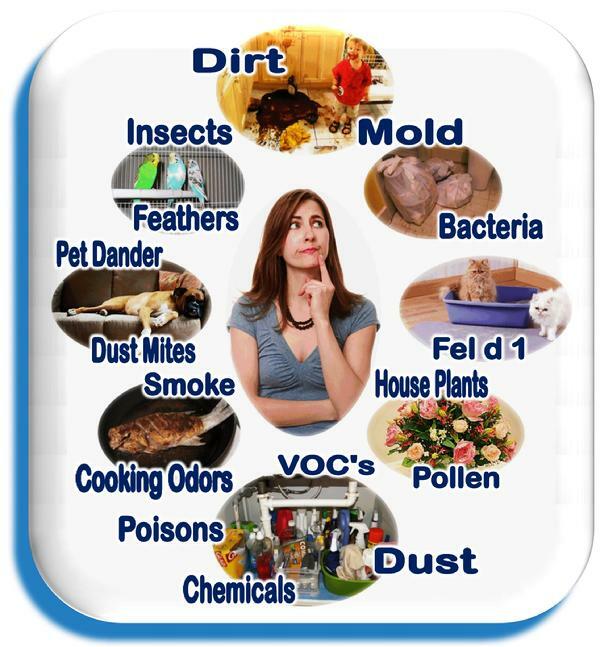 Other household allergens include dust mites and grease. Every six months, look for signs of pests and mold and mildew. If you are suspicious about toxins or mold, have an air quality test, experts say. When the carbon monoxide detector went off in her Arlington, Va., rental, Morley and her roommates unplugged it. Like many, they assumed the problem was with the detector. Because carbon monoxide is colorless and odorless, too often, homeowners don't realize there's a problem. After comparing symptoms of headaches and nausea, Morley and her roommates plugged back in the detector, which sounded a piercing alarm. The fire department confirmed high carbon monoxide levels. Faulty appliances were to blame. "It was scary," says Morley, who was treated with oxygen at the hospital. Exposure can cause a range of flu-like symptoms, including headaches, dizziness and nausea. But carbon monoxide exposure also can be fatal. Each year, more than 400 deaths are blamed on CO poisoning, according to the CDC. Gas fireplaces, furnaces, generators and appliances cause most carbon monoxide leaks, says Steorts. She recommends that her clients check whether appliances have been recalled, and that appliances and heating and cooling systems be inspected annually. In addition to installing CO detectors, examine all seals around doors and windows annually, paying close attention to the door between house and garage, because CO can leak into homes from cars, Steorts says. Paint companies began phasing out lead-based paint in 1951 and then banned it in 1978. Because it's no longer used, says Barbara Moore, manager of the Mount Washington Pediatric Hospital Lead Clinic in Baltimore, Md., "most people think it's a thing of the past." However, because there are so many older homes in the Washington area, "we still have a problem with lead poisoning," says Jerome A. Paulson, a physician who is director of the Mid-Atlantic Center for Children's Health and the Environment at Children's National Medical Center in Washington. Specks of dust flaking from window sills and doors get on floors and toys. Young children ingest the lead particles when they put their hands in their mouths. Owen Gray, a software engineer in Baltimore, and his wife were cautious about painted surfaces possibly containing lead in their 1890s rowhouse. But they were surprised when a stripped fireplace mantel tested positive for the toxic metal. "It never occurred to us that would be a problem," says Gray, whose toddler is being treated for elevated levels of lead. Lead exposure has been linked to loss of IQ, learning difficulties and developmental delays. And while many homeowners are warned about lead paint when they buy a home (or rent one), they may not take the risk seriously if they don't have children at the time, Paulson says. In addition to painted — and previously painted — surfaces, lead may also be found in some vinyl tiles, window blinds and plumbing fixtures, including chrome-plated brass faucets. In houses built before 1978, get a lead test by certified inspector. Contractors doing work that could disturb lead paint such as sanding or replacing windows should be certified by EPA-approved trainers. Lead is among the issues that the workgroup continues to make a priority. But more than that, says Matthew Ammon, deputy director of the Department of Housing and Urban Development's Office on Healthy Homes and Lead Hazard Control, "What it represents is a change in mind-set, in how we think about housing." The report doesn't propose regulations, but it calls for federal agencies — and there are more than nine involved — to work with each other and with local governments, nonprofit groups and communities, Ammon says. "This coordinated strategy is a big first step," says Morley, adding that she believes regulations are necessary. The reason that 90 percent of homes have smoke detectors is that they're required by local codes, she says. "If you rely solely on the voluntary action of property owners," says Morley, "the consequences are lost lives."